LOWLAND TARTAN'S (S.H.R. v. 367). Mr. H. A. Cockburn asked in your columns whether any Lowland tartan« appear in ‘the old collection of tartans’ which is at Moy Hall, and I took steps to inquire. 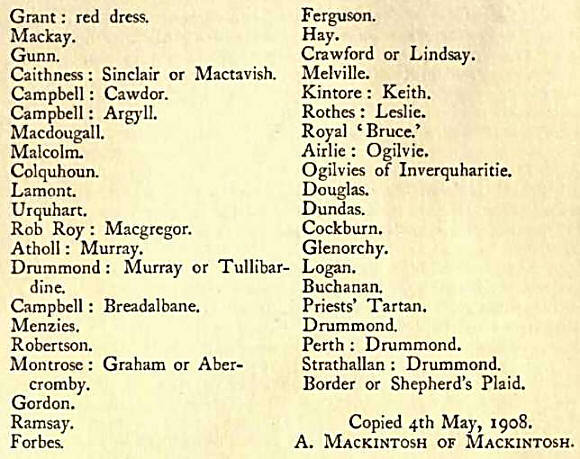 The Mackintosh kindly sent me the list, and as—though undertaker much nearer our own time than Mr. Cockburn probably imagined—it was a genuine attempt on the part of a Highland chieftain to get to the bottom of the tartan question, it is well worth placing on record. Scottish Tartans collected through the agency of Mr. Macdougall of Inverness in the year 1848. They are believed to be the only authentic tartans, and are bound by me Alexander Mackintosh of Mackintosh, 1873, with a view to their preservation as the only authentic tartans. 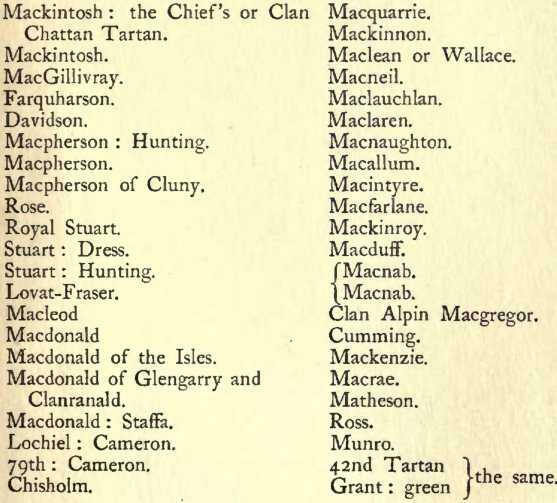 Now when dealing with this list we must remember that we are considering tartans only, and rot the origin of Highland families and names. The Norman-born Stewarts held dominion over Highland and Lowland, and so in a lesser degree did many a Southern brood. Their following was of their territory, not of their blood. Frasers, Hays, and Gordons, and a score of others, at some period took the tartan from their environment, and to a certain extent gave their name to a district and lost their distinctive Lowland character. When Mr. Cockburn wishes to know whether there is any proof of the antiquity of Lowland tartans, we must confine ourselves to those families which had no connection with the Highlands. In this list we will set: that his own Berwickshire patronymic has to back it only Douglas and Dundas. For the rest of us on the Border there is only shepherd’s plaid; I believe quite rightly. If Sir Walter Scott, steeped in historic lore, keen to rake up traditions, and born nearly a century and a half ago—in the days before the dividing lines were smudged over by frequent intercommunications—had no faith in Lowland tartans, it would be rash of us to think otherwise to-day. It is possible also to propound an argument in favour of this contention. It would be a bold man who would dogmatise as to the evolution of a Highland clan and as to the period at which certain combinations of colour were acknowledged as the joint property of a certain territory or sept, but we do know that from early days the old Highlanders were fond of bright hues, that they were cunning with the dye-pot, and that they remembered the Celtic tradition of many interlacing lines. When it came to fighting they wanted to travel light, and on foot. Coat armour and closed helmets were almost unknown among them. The true Highland chieftain was only primus inter pares, and he and his followers alike snatched their badges from the hillside, and the plaid became their uniform. In the low country, where the steel-clad mounted man was everything, matters were quite different. From the first dawn of heraldry the shield, the crest, the banner of the knight were the sign and the rallying point in battle. It is hardly too much to say that heraldry dominated medieval warfare. But, unless they were of his male kin, the knight’s followers could not bear his arms save as a badge of his service. Hence we have it that, whereas the armorial coat is a claim to a definite aristocracy of blood, the tartan is a sign of the mysterious democracy of clan feeling. For both, the r origin and their history were for the purposes of war, that, where every stranger was a possible enemy, friend should be known from foe.